How is your week going? Mine is going by at a snail’s pace. I’m also a little depressed today. One of my favorite shows, Psych, got cancelled and I’m so upset about it! It sounds silly, but it’s nice to have one or two shows that you really look forward to watching during the week, and this was one of those for me. It makes Wednesdays bearable! It’s in its 8th season so it’s definitely had a good run, but I’m just not ready to see it go. I knew it would be ending soon, but I thought there would be at least one more season. So sad! Have you ever had a favorite show that got cancelled or ended too soon? Oh well, c’est la vie. 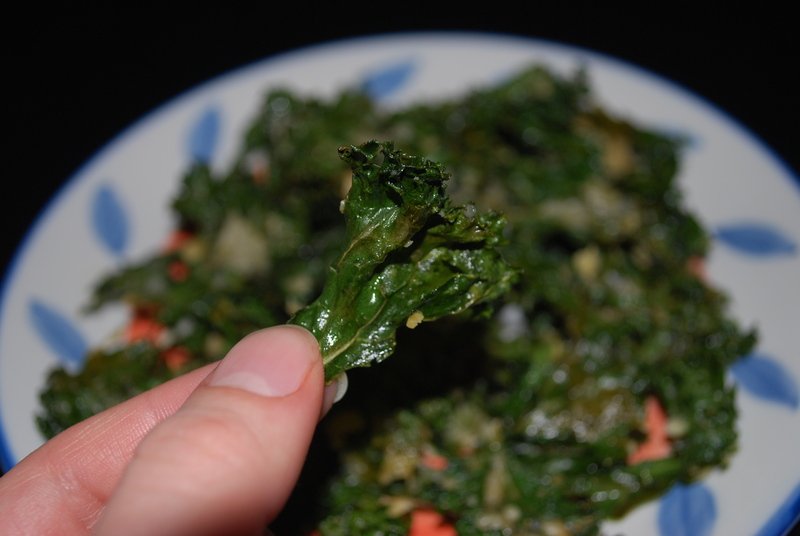 Today I have a wonderful, healthy snack idea for you: Kale chips! They are crunchy and tasty just like potato chips, but a million times healthier. They’re also incredibly easy to make. 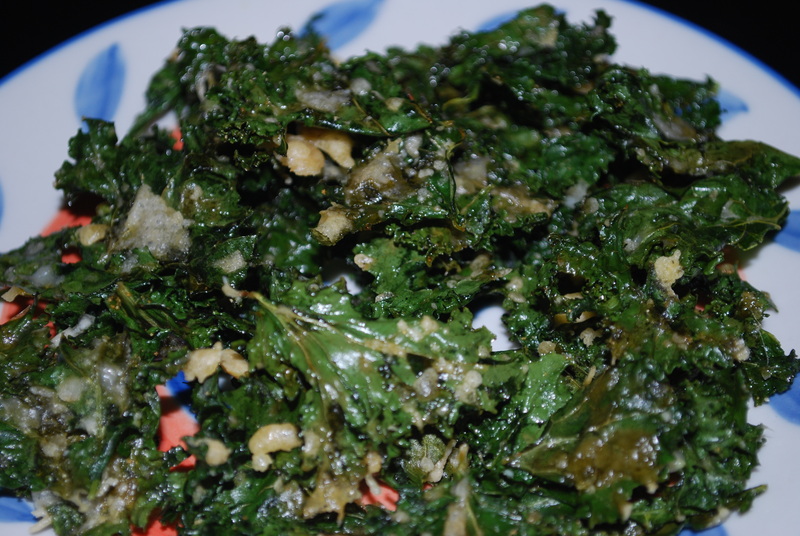 Next time you have a craving for a crunchy treat, try these kale chips instead of regular chips; you won’t be sorry. 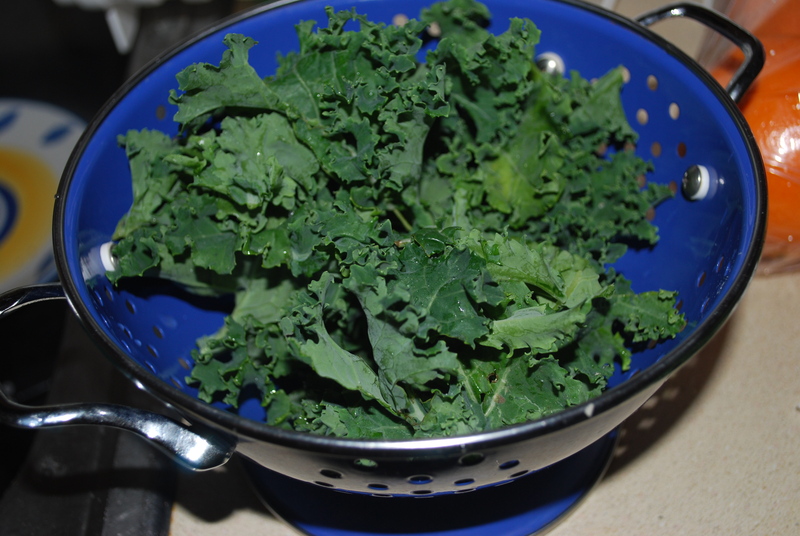 The idea came from this container of raw crunchy kale. 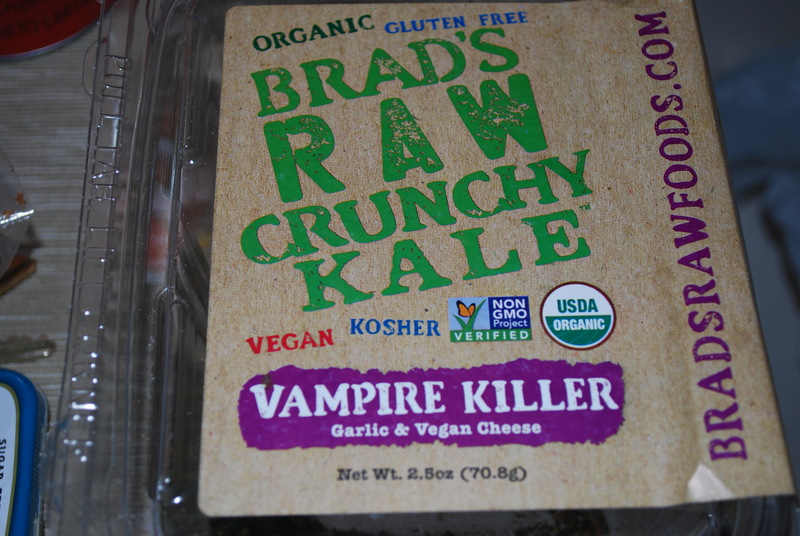 The flavor is “vampire killer” and it had garlic and vegan cheese. 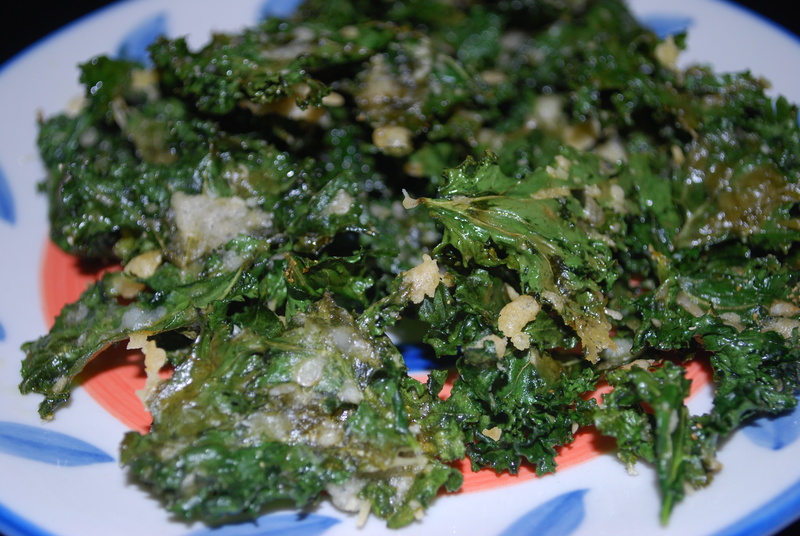 They were good, but since I am not on a raw nor vegan diet, I thought I’d try making some kale chips in the oven with garlic powder and parmesan cheese. 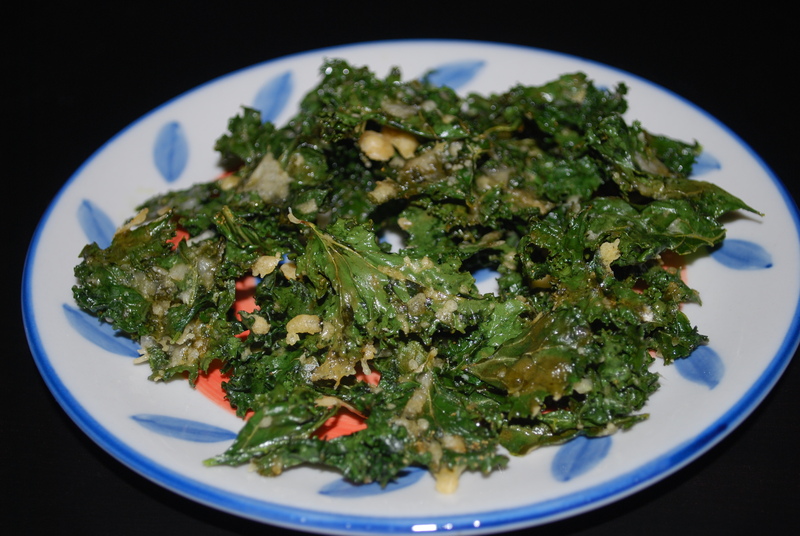 The best part about kale is that it doesn’t lose nutrients when it’s baked, so these are still very healthy. It was a huge success… they are soooooo good! I could snack on these all day. Begin your kale chips with the star of the show: one head of kale. Rip the leaves from the stems then rinse well and dry. Cut the kale into 1 1/2 – 2 inch pieces then in a bowl, mix with a tablespoon of olive oil and a sprinkling of sea salt and garlic powder. Be careful not to over-salt these. They shrink down a lot in size when they bake so not very much salt is needed. 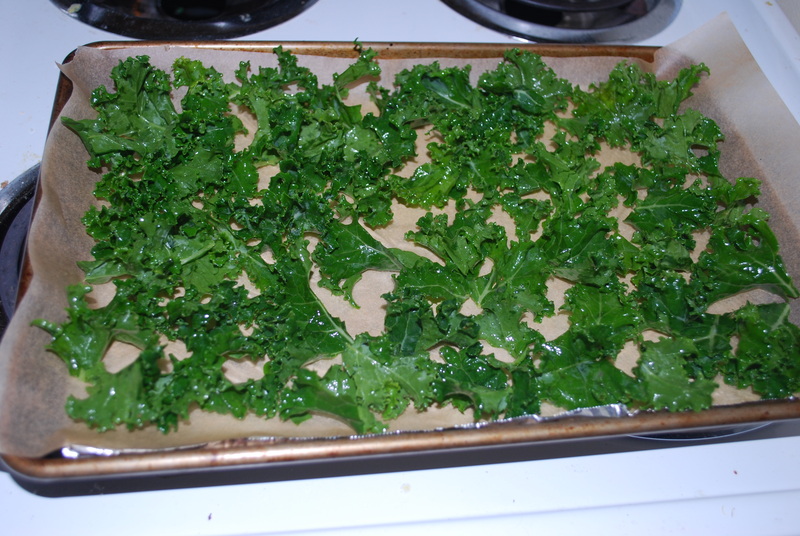 Line a baking sheet with parchment paper and lay the kale pieces out onto the sheet. Sprinkle with parmesan cheese, then bake in a 275 degree oven for 20 minutes or until edges are brown and kale is crispy, flipping kale pieces halfway through. Preheat oven to 275. Line baking sheet with parchment paper and set aside. 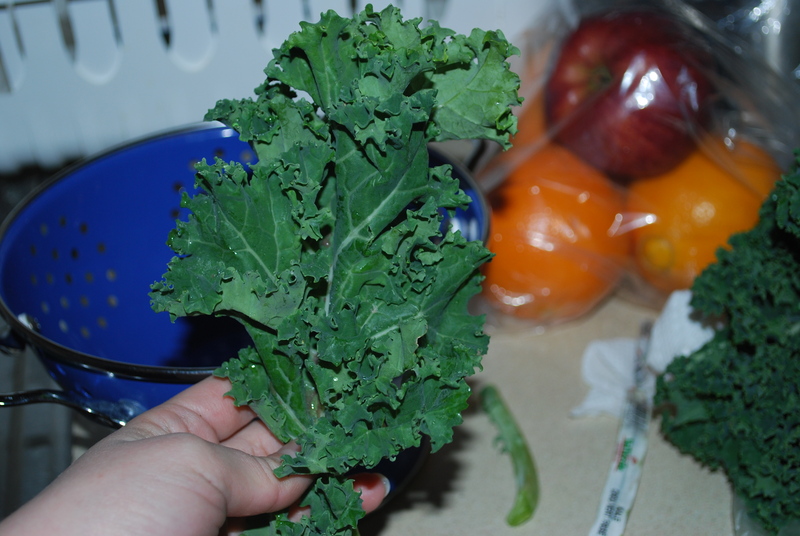 Remove kale leaves from stems and rinse the leaves well and dry. 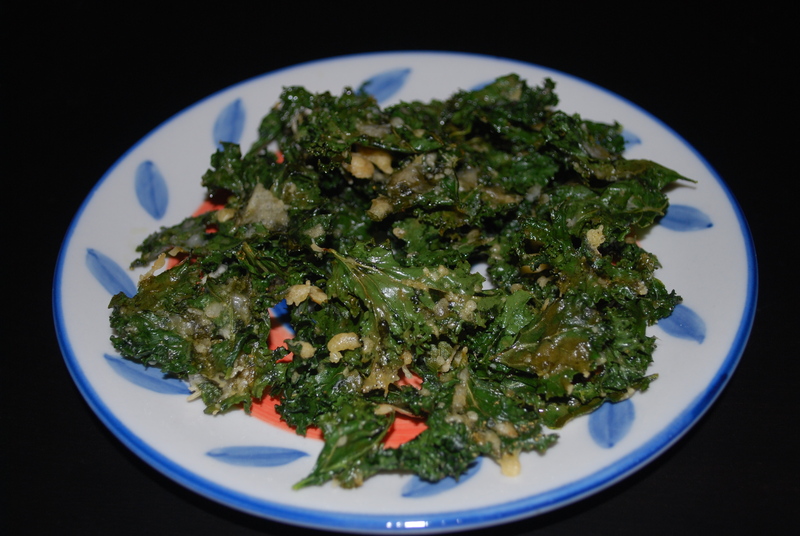 Cut the kale leaves into 1 1/2 – 2 inch pieces. Mix leaves with 1 tablespoon olive oil and a sprinkling of garlic powder and sea salt. 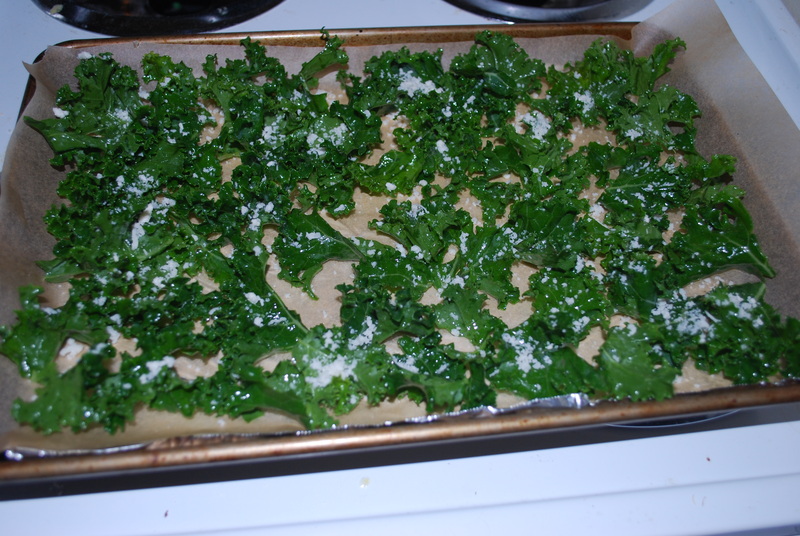 Spread the kale out on the baking sheet, then top with a sprinkling of parmesan cheese. 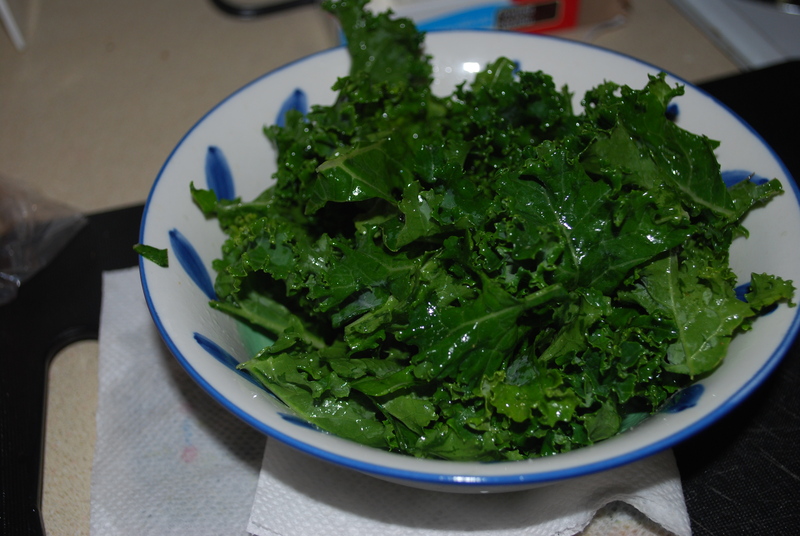 Place kale in the oven and cook for 20 minutes, flipping kale halfway through. 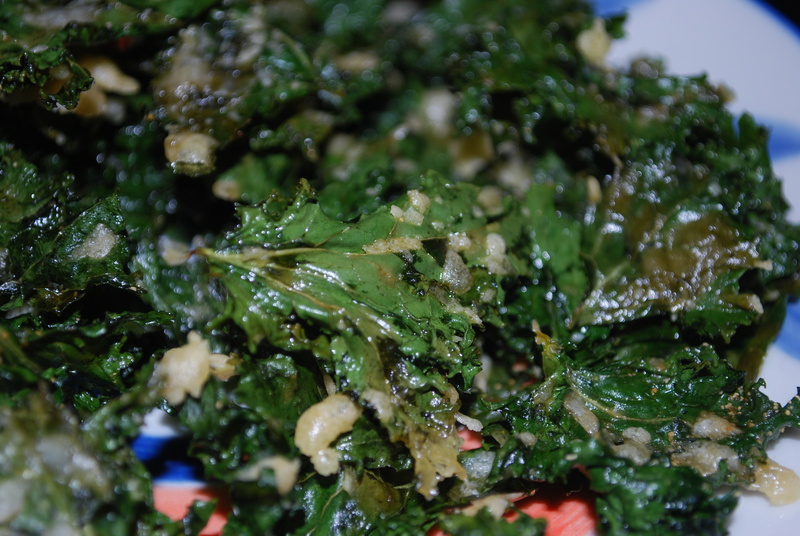 Remove kale from the oven when the edges are brown and the kale is crispy. This entry was posted in Appetizers, Healthy, Sides, Snacks and tagged crispy, garlic, kale, kale chips, parmesan. Bookmark the permalink.